Okay, I’m not really the queen of convenience when it comes to food. I usually take the long way around, making recipes from scratch and chopping vegetables instead of buying them pre-cut and packaged. But the older I get, the less time I have to spend long hours in the kitchen. Cooking is a great hobby, but labor-intensive recipes are not always practical. When I was a kid, every once in a while my mom made Hamburger Helper and my dad always had a box of Rice a Roni in the pantry. 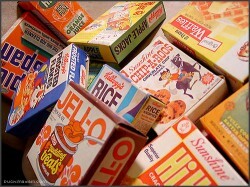 With so many kids and so little time, it makes sense now that my parents always had back up boxed food on hand. As an adult, I have my own standby: convenience foods I try to keep stocked and available. Amy’s Soups – I’ve been eating Amy’s soups for 10 years and I still love them. They’re vegetarian, lower in sodium and fat than other canned soups, and made without preservatives. Last week I added a cooked red potato to a can of minestrone for a very filling lunch. Pair with a green salad or a grilled cheese and you’ll have dinner on the table in less than 15 minutes. Costco sells a box of eight (four Lentil and four Minestrone) for $11.99. Trader Joe’s Vegetarian Sausage Patties – They taste like real breakfast sausage and they’re WAY healthier. They heat in the microwave in one minutes or in the skillet in five. Skip the drive through and make your own breakfast sandwich. Heat, dice and add to a scramble. You won’t know the difference! They’re a little expensive, by my standards, at $3.49 for a box of six. Instant miso soup packets – Hot beverages pair nicely with fall and winter, but one can only drink so much coffee and tea. Sometimes, the perfect snack on a cold winter day is a hot cup of soup. You can find dehydrated miso soup at Trader Joe’s, natural food stores, and most Asian markets. The Japanese eat miso soup for breakfast. Try it! Lara Bars – A nutrition power house packed into a tiny, convenient little bar. The great thing about Lara Bars is they contain zero junk, just nuts and fruit. A Lara Bar, some yogurt and a banana is the perfect grab and go breakfast. Great for hiking and traveling, especially in places where fruit and fiber may not be widely accessible. Do you have any favorite convenience foods? What do you eat when you need a quick meal or snack?